Episerver CMS extensions to Visual Studio. This is the Visual Studio extensions for Episerver CMS. Report bugs and feature requests on Episerver World. The Visual Studio extensions for Episerver CMS contains features to make it easier to develop on the Episerver platform. 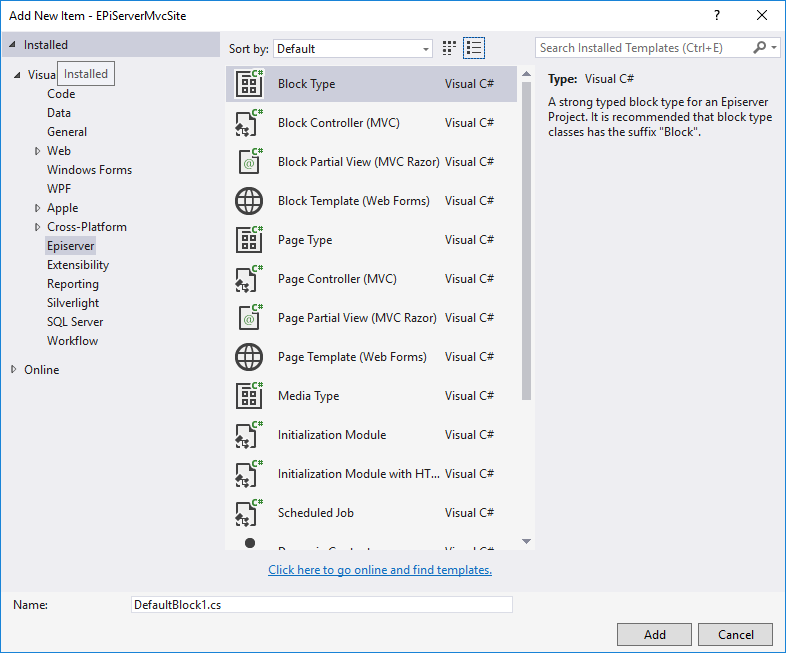 More information about using this extension to Visual Studio can be found in Getting Started. The Visual Studio extension contains the following project templates in Visual Studio. 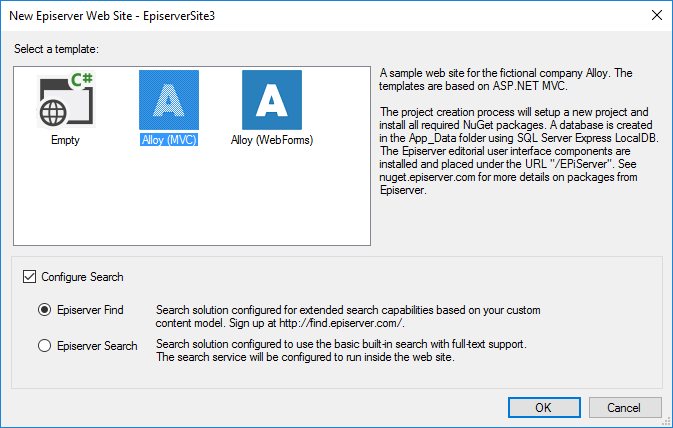 Use Add > New Project -> Visual C# -> Episerver -> Episerver Web Site to create a new site. These project templates requires SQL Server Express LocalDB and IIS Express. The Visual Studio extension contains the following templates using the Add > New Item option in Visual Studio. These item templates can be used with any web project (c#), some of the templates are also available on c# class libraries. *) Contains an unsupported build of Find 13.2.0 that should not be used. Upgrade to a new version of the VS integration. As the GeoLite database and provider have been obsoleted, it is no longer configured when creating a new Episerver CMS solution. Dependencies on TinyMCE and StructureMap removed. Remove the possibility to create "Online Center Gadgets"
Project templates merged into a unified dialog for "New Project"
Support for both 7.0 and 7.5 projects. Added Media Type (only applicable in 7.5 projects). Minor fix in Gadget Wizard.